Details about how to PID-tune are not covered here. 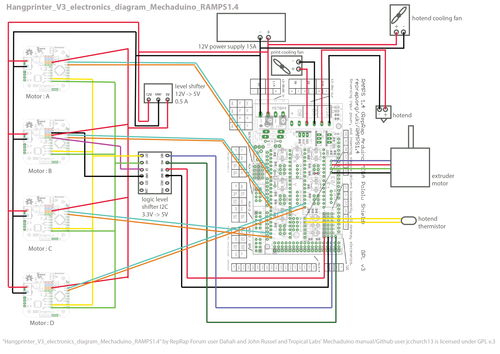 Wiring diagram kindly contributed by RepRap forum user Dahah. The raw source of this manual is published under the <a href="https://github.com/tobbelobb/hangprinter/blob/Openscad_version_3/LICENSE" target="_blank">GPL-2.0 license</a>, and is being maintained in the <a href="https://github.com/tobbelobb/hangprinter/tree/Openscad_version_3/doc" target="_blank">Hangprinter repo</a>. The raw text source of this manual is published under the <a href="https://github.com/tobbelobb/hangprinter/blob/Openscad_version_3/LICENSE" target="_blank">GPL-2.0 license</a>, and is being maintained in the <a href="https://github.com/tobbelobb/hangprinter/tree/Openscad_version_3/doc" target="_blank">Hangprinter repo</a>. All images and videos are also published under the GPL-2.0, except the wiring diagram, which is published under the GPLv3 license.